I have some wonderful readers, lemme tell you. They remember birthdays. Thanks for the e-cards, the regular cardboard kind, the sweet e-mails. 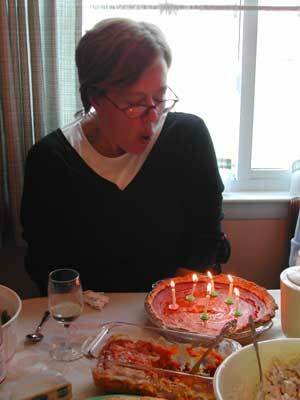 You can see from the picture what day it was, as well as my every-few-years birthday dessert, pumpkin pie. It was a pleasant day — I believe Peyton Manning may have dedicated the Colts victory to me — and if I spent it cooking, well, I like cooking. I spent last year’s birthday cooking, for the Fellows, and that was a great one too. Don’t be fooled by the number of candles. I’m only giving my age in Russian from now on. It’s in the headline, if you feel like transliterating and translating. I got the new Gourmet cookbook for my birthday, which Mary recommends in the comments above, and a double-blade mezzaluna even nicer than Nigella’s. An appropriate cook’s birthday. Of course we spent the last few days traveling the Great Buckeye Triangle — Fort to Defiance, Defiance to Columbus, Columbus to Fort. We tried to do good deeds — cooked T’giving for Alan’s old ma, upgraded my sister’s iMac to Panther — and had many bestowed upon us, including but not limited to a standing rib roast and a very soft cabernet. The upgrade took far longer than I thought it would — it was an erase-and-reload of the system software, and I wanted, as we so often do in the erase-and-reload phases of our life, to do it right this time. In tribute, however, I will accept the MP3 copy of 50 Cent’s “In Da Club” I found in her music file while I was backing up. Why? Because there’s nothing more pathetic than a woman of sorok syem lyet listening to 50 Cent, that’s why. Note the wine glass in front of me in that picture, too. This represents my silent protest against my in-laws, who insist that the Thanksgiving meal should be served at lunchtime. I was raised by people who ate at a more civilized hour, but I grant that your mileage may vary. My personal feeling is, if I’m going to eat a zillion-calorie, carb-heavy, tryptophan-laden meal at 1 p.m., then don’t complain when the sound of snoring fills the house at 2:30. So I always have a glass or two of wine, even if it means I start drinking at noon. It helps me sleep a little deeper. Columbus, Columbus the star of the state! Cdnem Rogdenia. Life begins at 40. I made the Indiana Sugar Cream Pie. Simply the best I ever tasted. Enjoy the cookbook. It has a pretty wide range of things, from stuff you always wanted to make to recipes you would not attempt even if you were interested in eating them. We (the boys, the in-house Brit and myself) had Thanksgiving at a small restaurant operated by Evan Kleiman, a cookbook writer and chef here in LA. She did all the cooking herself. It was family style and intimate enough to border on invitation only. The food was very wonderful. Like really wonderful. You would have hated my children because they eat like Nigella’s, asking for seconds, then thirds, on the braised chard. They just eat that way; what can I say? Put me in the same column as Alan. Speaking of the yoni though, did you see the problems the Tribune had with the “You C-nt Say That” article? Man, after working through this book, I can’t help but think that a mezzaluna is cheating. Double bladed, no less. How you gonna sharpen that sucka? I’m just not a fan. I’m thinking that I’ll use my 10″ wide blade Wusthof for the big things, my Kyocera ceramic paring for the little stuff, and my Cuisinart mini-prep for the stuff that I just want small, and don’t care how it looks. Of course, you could always just get a veg-o-matic, but then, even Sam Popeil’s daughter didn’t use one of those. James • 4dbirds • Mary • KCK • John • Mindy • ashley • and YOU.